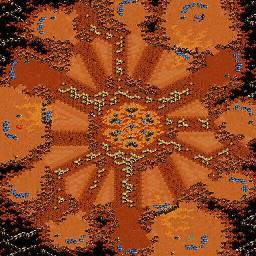 Freakling cuz of that particular high ground tile spam, the map name has an accent in it, and the good symmetry. Reminds me of gladiator a bit cuz of the hills, looks good. Red's base is awkward? Is squished in, expansion south close than the other bases, low ground to the east seems smaller than others. Seems like bottom teal nat is safer than the others when it comes to muta harass. Haven't opened the map, but red does look kinda cramped. EDIT: How do units path over all the change of elevation? I remember people saying that ground units have a weird preference for low ground > high ground, and that terrain with lots of changes in elevation causes usually linear pathing to turn kinda wobbly or something like that. Why am I the only one to ever use that, though o_O ?! That is because you spell that with an accent ;D In french, that is. “ Reminds me of gladiator a bit cuz of the hills, looks good. Well, obviously this is (3)Gladiator. Kind of sort of; as obviously this map does not use a reverse nat setup. Gotta squish some things to get good use of space. The issue with both of these two new maps of mine is that the concepts call for as much middle space as possible, or important pathways would just get to tight. It is generally easier to put "squished mains" at the top or bottom edge, but I also really wanted these nice, symmetric and easy to wall on all locations nat positions, so that main is the one thing that I had to compromise a bit on. Still, I made sure that there is a nice macro space near the ramp (with some halfway decent planning 8+ factories or gates should easily fit in there, I had no problems building a cluster of some 12 or gates...), so it should be alright. “ low ground to the east seems smaller than others. again, not quite sure which area you mean. “ Seems like bottom teal nat is safer than the others when it comes to muta harass. That is why I did put tar behind all the mineral lines instead of extending the cliffs further, makes turrets more effective. Should it still be a problem, I could add a bit more turret space behind the mineral lines as compensation (which could also balance positions against flybys to the main). “ How do units path over all the change of elevation? I remember people saying that ground units have a weird preference for low ground > high ground, and that terrain with lots of changes in elevation causes usually linear pathing to turn kinda wobbly or something like that. What is true is that changing terrain levels somewhere on a map influences the pathfinding and so do certain doodad tiles. However, whether the overall effect is a good or bad one seems to be, like anything else related to BW pathfinding, mostly a lottery... From some in-game testing I have done on this map so far I can say so much: The real danger are actually all the small obstacles around the middle, which tend to split an army around different paths if one sends them somewhere cross-map without carefully monitoring them. However, this is true to some extend for any map with multiple paths. Really nice so far, awesome. Nice oil pipes. This map deserves to be finished for sure. I hope this proves to CrystalDrag that desert terrain is in fact awesome! How about pushing the starting locations towards the edges at each main (just enough so there is 1 tile gap between the resources and the edge)? That does not really give you more space, though. In fact space would be lost for building depots/pylons/tech buildings against the edge behind the minerals. Usually I leave this as a little detail that can be changed in the final debugging stage, depending on how I can achieve the best mining, actually. Mining/pathfinding optimization is done for now. Gonna do something about unfinished blends and add some basic deco next. As far as playability goes, I'll add some more unbuildable low ground in the ring around the middle, otherwise this is final now. Legionnaire is basically Gladiator on sand. I didn't check the PvZ wall-ins, but it looks like some naturals are easier to wall-in than the other. Well, it is of course inspired by Gladiator. However, the fact that it has not an inverse main-natural layout and that there are safer/closer/more options for a 3rd (especially for Terran) should change up strategies and balance quite a bit. You can do very standard wall-ins on all locations: Forge left, Gate right on the bottom position and Gate over Forge over Pylon with units spawning on the inside at the top positions. Terran can Rax, 2 depot wall-in with Marines spawning on the inside on all positions. Should not be too hard to figure out how. May i ask you how you do the rotational symmetries? As you know i'm just starting out, and the rotational symmetry features in SCM Draft 2 don't seem to work the way i like it. 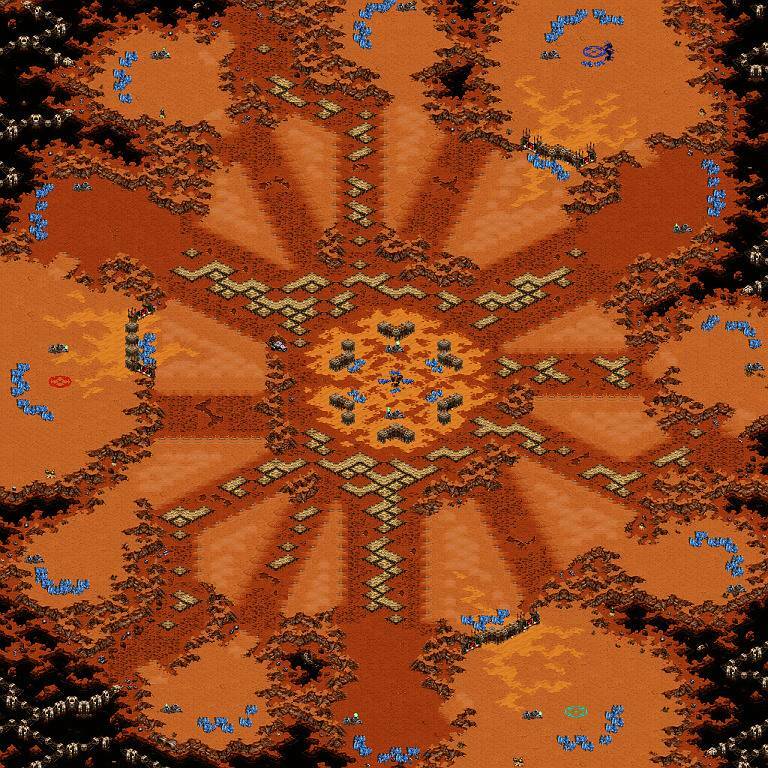 I would love to do some 4 player and 3 player rotational maps. Do you have to do it manually? Yes. I often do some sort of pen and paper sketch first. Yes rotational symmetry for 3+ players usually has to be planned out. Luckily for us the maps have a coordinate system built in that you can use to eyeball certain distances. As a general rule I try to stretch things vertically and squish them horizontally, since isom tiles height is half of it's width. The look and feel of the brush is a bit misleading when working on symmetry. The symmetry tools SI put in are good but you will waste a lot of space because it tries to draw around a point in the center of the map, resulting in a circle shape within a square map. For odd player numbers, in general you want to have the centre off-centre, because there is always a main (or two in case of five spawn maps) right in the middle (more or less) of one of the map edges which simply needs more space because you can distort proportions only so much by squeezing things out. Furthermore you want an increasing radial stretch the closer to the corners and the further from the middle you are and need to compensate by tightening angles towards the corners.